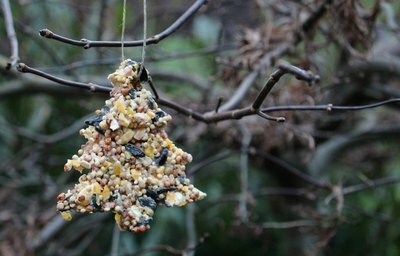 Adorable birdseed ornaments are an inexpensive activity the whole family can enjoy making on a lazy weekend afternoon. 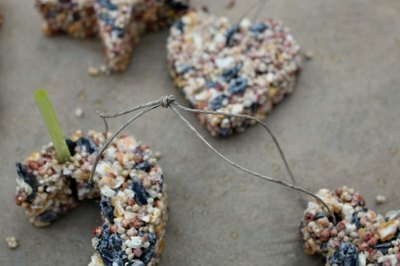 The kids will have a ball making them, and the birds will enjoy eating them. The first version offered here produces cookie-shaped ornaments kids especially love, but they really only work in cold climates where the ornaments remain frozen. In warmer climates, the second version is ideal. 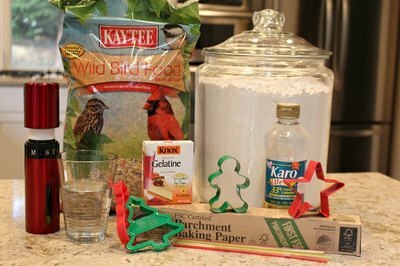 Cut straws into 3-inch segments and press the straw into the top one-fourth of the birdseed-filled cookie cutter. 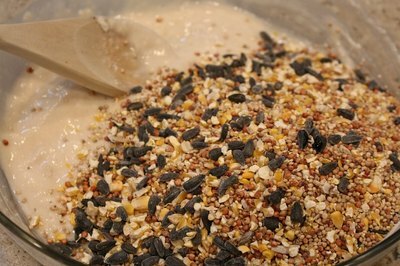 Make sure the hole goes all the way through the mixture. 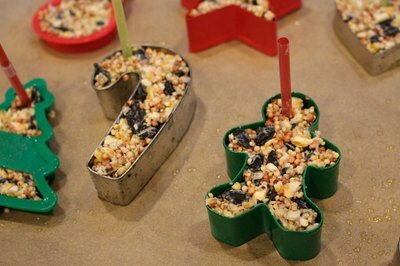 Leave the straw in the ornament and allow to dry for 3 to 4 hours. 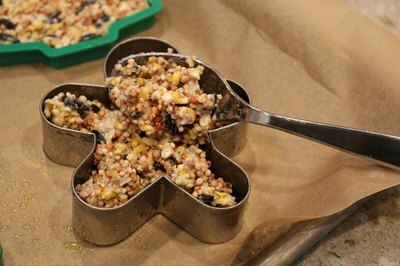 Once the birdseed ornaments have dried, take out the straw and carefully remove the ornaments from the cookie cutters. Allow to harden overnight in the freezer. 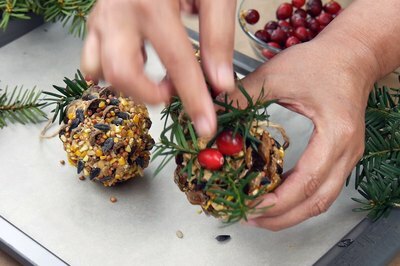 Gather pinecones, peanut butter, oatmeal, birdseed, cranberries and evergreen cuttings (optional). Mix 1/4 c of oatmeal into 1/2 c of peanut butter. 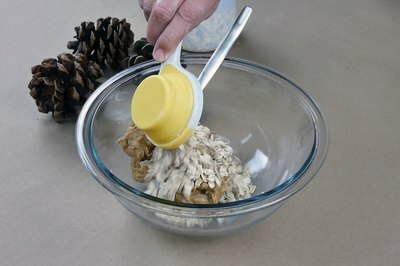 Press the peanut butter mixture into the pinecones. 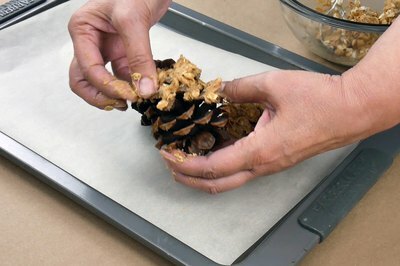 Roll the pinecones in birdseed, pressing the seeds into the peanut butter mixture. 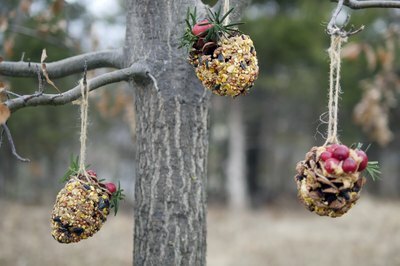 Wrap twine around the pinecone and tie a knot at the top of a hanging loop. 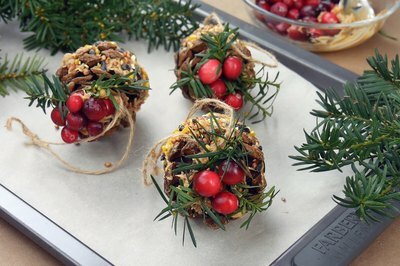 Add peanut butter to the top of the pinecone and top with evergreen cuttings and cranberries. 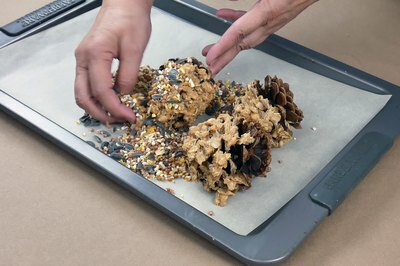 Repeat to create pinecones for your own yard and maybe even as gifts for neighbors and friends. 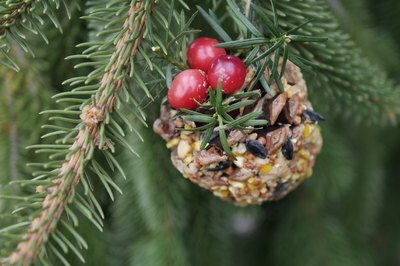 Hang the pinecones in trees and watch for birds! The cookie cutter ornaments will fall apart in warm weather. If the temperature in your yard typically rises above freezing, try the pinecone version instead.